Malcom T. Liepke, a self taught artist from Minneaopolis, has captivated the world with his beautiful and expressive oil paintings. A painter all his life, the inspiration he finds in the Impressionist painters such as Edgar Degas and Henri Toulouse-Lautrec is clearly visible in his works aligned with his own signature style. Liepke usually layers on the paint with heavy and wide brushstrokes that anchors his subject into the painting. Usually paying very little attention to the background, Liepke’s works solely focus on his subject, usually a female painted with vivid colours as she stares boldly at the viewer. The subjects always look fluid and the paint never looks like its completely dried. If one were to touch it, it would almost seem like paint would stay on their hands. This technique is named by Liepke as ‘oiling up’ as he works on a wet campus. This aids Liepke in ensuring that his subject does not look stoic, the painterly brushstrokes captures his subject in the middle of an action and it’s as if they can freely move. 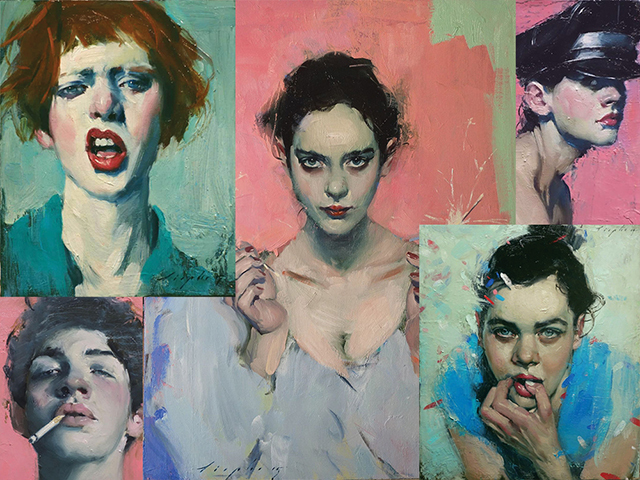 Despite influence from painters of centuries past, Liepke vows to paint contemporary figures of today. He explores the themes of loneliness and uncertainty that are universally attractive to all generations, past and future. The setting is usually the interior of a bar, a nightclub or a house party as Liepke explores the nightlife scenes and the people who participate. Perhaps it’s a message that one can feel lonely despite being surrounded by people. The backgrounds are usually more so “negative space” as Liepke hopes that your attention is solely grabbed by his subject, but this furthers the isolation the figures appear to feel. The brushstrokes on the background are thick and unmoveable in contrast to the flighty and liquid strokes of the subject, locking them in place. In conclusion, Malcom T. Liepke is an incredibly successful contemporary artist, having many of his works featured in both public and private collections, including the National Academy of Design. His vivid paintings that explore the universal themes of isolation will captivate the hearts of many for years and decades to come.